Precious metals mutual funds present a great risk diversified way to invest in mining stocks and help you take advantage of another dimension of precious metal investment. Gold or silver mutual funds focus on buying shares of various companies involved in precious metal exploration, prospecting and mining. The performance of precious metals mutual funds is not directly linked to the precious metals prices but to the financial performance of certain mining companies they invest into. Below you will find top 10 reasons why you should consider investing in precious metals mutual funds. 1. Buying into precious metals mutual funds vs. buying shares of single mining companies allows you to minimize investment risks should a certain mining company perform poorly. 2. When you invest in silver of gold mutual funds, you take guesswork our of the investment game and let professional precious metal s mutual funds do the analysis for you, especially if you are a novice investor. 3. Investing in precious metals mutual funds allows you to diversify investment risks that come with physical precious metals bullions investment and incurring extra storage costs. 4. Silver or gold mutual funds are more liquid than physical gold and could be sold more easily should a need arise. 5. 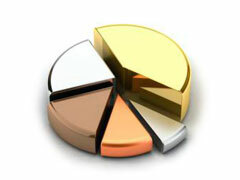 Gold/ silver/platinum mutual funds are easy to buy or sell. 6. You can choose from a plethora of precious metals mutual funds with various investment styles whether you want to go conservative or bold, it’s your call. 7. You can choose whether you want to pay a brokerage fee for buying into mutual fund that is called a “load”. No load mutual funds tend to perform better because there’s no initial fee for purchasing them that might eat into your earnings. 8. Investing in precious metals related equities like mutual funds provides a safe haven for your investment in difficult economic times and hedges against inflation. 9. Investing in precious metals mutual funds gives you a piece of mind that your investment is well taken care of by the professional management of the mutual fund. 10. Due to high industrial demands for gold and very favorable investor interest, silver, gold and platinum mutual funds remain one of the most popular means of investment for the near future.